This installment of the Advanced Adventures series clocks in at 25 pages, 1 page front/back cover, 1 page editorial/ToC, 1 page advertisement, 1 page SRD, leaving us with 21 pages of content, so let’s take a look! This review was requested by my patreons, to be undertaken at my convenience. Okay, first of all, this is, as all Advanced Adventures-modules, written for the OSRIC system, but conversions to other OSR-systems are easy enough. The formatting deviates in some aspects from OSRIC’s formatting conversions. This module is intended for characters level 4 – 7, though it should be noted that it requires a smart and well-rounded group to excel – this is old-school in that PCs not smart enough to run in some instances, will indeed die. Horribly, I might add. The pdf does not sport read-aloud text beyond the brief introductory prose, which means that this needs to be properly prepared. 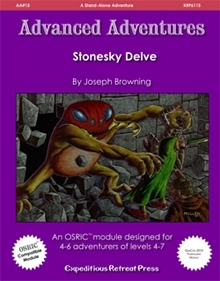 There is another special thing to note here: “Stonesky Delve” is the first tournament module in the series, and as such, it spends quite a lot of space to explain how to run and judge the performance of the adventuring groups. One page is devoted to the time scoring sheet, one to the exploration scoring sheet, and two pages contain a total of 10 pregens. While I applaud the inclusion of so many pregens, it’s annoying that you have to basically copy their stats by hand. The equipment of all characters are on the back of the page. Now, the tournament framework means that the module is intended to be run in two 4-hour slots; in-game, the PCs get a cave moth pupa that will hatch in 72 hours, for the PCs have to spend at least 72 hours in-game exploring the complex…and a maximum of 120 hours. So yeah, we have a time-limit here, which is smart, as it adds a degree of urgency to the proceedings. Indeed, the framework is simple: The PCs are hired by dwarves to explore and map caverns where ancient dwarven holds may be found. This is also the reason I don’t mind the lack of player-friendly maps here – it is, after all, the task of PCs to map this place. It should be noted that, unlike most convention/tournament modules, this may be hard, but it’s NOT just a meatgrinder! This, if anything, behaves more like a ROLEplaying module than all previously-released installments in the series. It should also be noted that the module can easily be sliced in two, should you desire to do so. The pdf sports a couple of unique/variant monsters – an umber hulk variation, a predator with a massive tongue that works best in conjunction with piercers (cool! ), a three-tongued giant frog, a spitting gibbering mouther variant, and the classic vampire moss also gets stats. These feel down to earth and somewhat plausible. Solid. All right, only GMs around? Great! So, one glance on the map will show you what sets the first aspect of the module apart from many others: the first dungeon of the module represents an exploration of the caves of the eponymous Stonesky, but unlike countless modules out there, this complex manages to really evoke a sense of plausible fantasy spelunking. This is, in part due to the clever positioning of enemies, which are chosen and placed in order to evoke a sensible illusion of a subterranean eco-system; at the same time, the complex is set apart by its focus on verticality: When you’re rappelling down a massive tunnel next to a waterfall, and try to get down in the middle of the place to avoid being eaten by cave morays, you’ll know what I mean. The complex comes with a side-view and a top-down map of this area to help you picture the complex. This sense of fantastic spelunking is absolutely amazing and enjoyable, and, more importantly, it rewards the exploration that is part of the central story angle: Thorough players can, for example, find a well-hidden cavern where the echoes of a dwarven deity’s words resound. This secret is rewarded well regarding scoring, and is but one aspect of the adventure. Aforementioned waterfall? Curious PCs that brave the tunnel can find a leaking decanter of endless water as the source, as well as the remains of a being. This commitment to details and player agenda over rolling the dice is evident in many details: Smart PCs can avoid combats and hazards, and exploration is thoroughly rewarded, and blends the plausible quasi-realism of spelunking with the wonderful magical sprinklings that made the best of the AD&D modules of old stand out. Danger and rewards are closely entwined, and player-skill trumps dice rolling. PCs can accidentally flood passages with slightly acidic water, and from cramped spaces to vast differences in height, the cave complex is absolutely fantastic: In one cavern, the PCs may happen upon the resting place of Radivither the Breaker, a dwarf of the first generation, he who discovered theft, death, insanity and murder – a mighty impulse and spirit, he is not a combat encounter: Instead, Radivither acts as a kind of haunt/possessing, malignant entity – but encountering this deadly echo can also provide a great boon to the dwarves that hired the PCs. This commitment to focusing on player- as opposed to PC-agenda also can be found in the tunnel that allows the PCs to make their way to the second part of the module: To get there, the PCs have to pass a magical means that prevents access, seemingly preventing progress. The means to bypass this magic is to walk the corridor backwards. Really cool! Part II of the adventure, the Hold of Dwergma, is a more conventional dungeon without the verticality of the cavern complex that preceded this place; the complex comes with a sewer system that clever PCs can (and should) use – for there is a mighty (and insane) cleric/magic-user here, one who can and will annihilate careless PCs if they do not take care…particularly since the fellow actually gets a detailed tactics breakdown. The PCs can encounter an animated stone fist with flawed intruder detection; hallucinatory tobacco, ancient tomes of lore (noted with title, weight and gp-value), a grue-like thing and a flail snail – the inhabitants are well chosen, the complex is smart and flavorful, and e.g. traps are telegraphed in a fair manner. That being said, this second part does not reach the amazing creativity of the first part of the module, feeling more like a classic denouement to the potentially fantastic things that you can encounter in the first half. Editing and formatting are very good on a rules-language level; on a formal level, the pdf has a couple more typo-level glitches than usual for the series. Layout adheres to the classic two-column b/w-standard of the series, and we get a couple of solid b/w-artworks. The cartography is b/w and solid, and the existence of a side-view map of part I of the module is a plus. Due to the presence of the PCs-do-cartography-angle, I won’t complain about the lack of player-friendly maps. The pdf comes fully bookmarked for your convenience. Joseph Browning delivers pure old-school goodness in this module. Stonesky delve feels fantastic and plausible, evocative and dangerous, and remains, in spite of its harsh challenges, FAIR. This adventure rewards skillful players over good rolls of the bones, presents a great blend of strange flora and fauna and truly fantastic, hazard-laden caverns. The presence of consequences left and right, the constant rewarding of clever play, and the smart diversity of challenges faced all blend together to make the first part of this module downright amazing. Part II of the module falls a bit short of the fantastic wonder evoked by the first half on the adventure. The presentation of the helpful pregens is not exactly perfect, though. Still, as a whole, this most assuredly makes for one of the best adventures in the series – at least among those that I’ve covered so far. The first part is fantastic and warrants getting this adventure on its own; the second part, while not as strong, is still a good adventure. As a whole, one can consider this to be a great old-school module, well worth checking out, and as such, this receives a final verdict of 5 stars. You can get this great spelunking trip in ancient, dwarven territory here on OBS!